I recently read that spanikopita is “in the burek family of pastries.” What does that mean you might reasonably ask? Burek is a family of baked or fried filled pastries made of a thin flaky dough known as phyllo “most probably invented in what is now Modern Turkey, in the Anatolian Provinces of the Ottoman Empire in its early era, to become a popular element of Ottoman cuisine.” Equally interesting is that there is a traditional vegan version eaten during the Great Lent and other religious fasts. But why deprive yourself of its earthy goodness the rest of the year? Lent. Summer Solstice. May 2-4 weekend. Martin Luther King Jr. Day. National Hug a Drummer Day. It’s all good and it’s a fun Friday night dinner to make with the kids so they can get their hands dirty and help out with the layering and folding … fast or no fast. In a large saucepan over low heat, combine the tofu cubes, water, lemon juice, salt, basil, and oregano. Simmer for 30 minutes and then set aside to cool. Refrigerate overnight in the brine and then drain. Heat olive oil in a large cast iron skillet over medium high heat. Add shallots and saute until tender. Add spinach and cook until spinach wilts. Set aside to cool and then drain, squeezing out as much liquid as possible. In a large bowl, mix together cooked spinach and shallots, herbed tofu, dill, and parsley. Add sea salt and pepper to taste. Set aside and preheat oven to 350 degrees. Lay out one sheet of phyllo. Keep the rest covered with a slightly damp tea towel so they don’t dry out. Brush the one sheet with olive oil using a pastry, or basting, brush. Add the next sheet and brush it with olive oil. 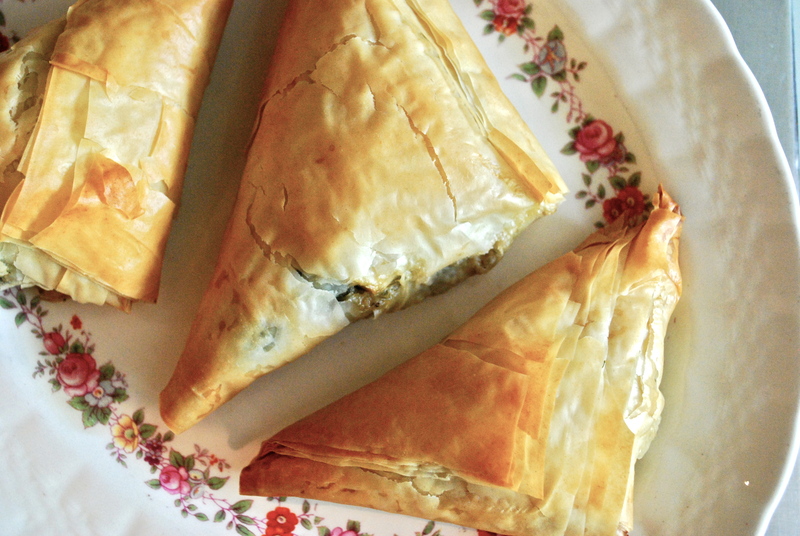 Repeat until you’ve got 5 layers of phyllo. Cut the phyllo into 3 equal strips, about 3 inches wide. Place some of the spinach mixture in a triangular shape in the bottom corner of one of the strips. 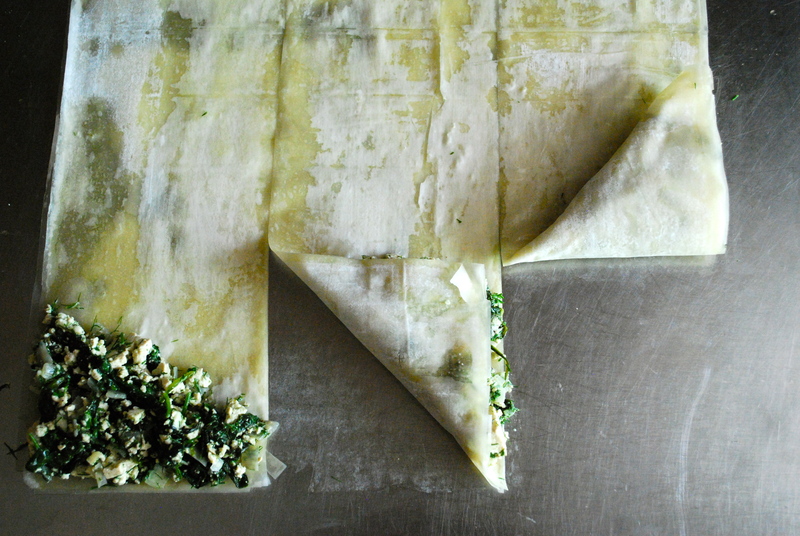 Carefully fold the phyllo along with the spinach mixture diagonally along the inside edge. Keep folding along the strip until you reach the end. Place on a cookie sheet lined with parchment. 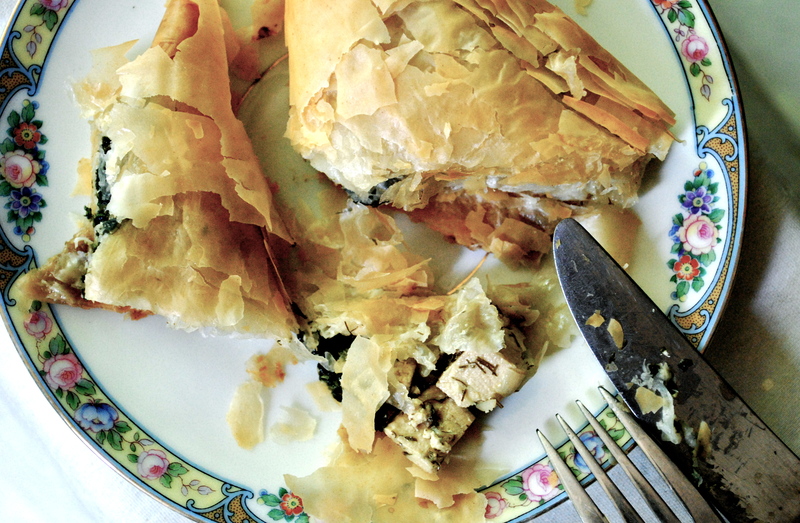 Repeat until all the phyllo and spinach mixture has been used. Bake at 350 degrees for 30 – 35 minutes until the spanikopita is browned and crisp on top. Serve with a fresh green salad, and a glass of crisp, cool Greek wine like the 2007 Gerovassiliou Malagousia. By the way, we finished our aloo gobi leftovers yesterday. It just kept getting better and better! I’m kind of jealous. I wish I had aloo gobi leftovers in my fridge! This recipe was a big hit … I’m thinking we might have to institute a weekly Indian night. Enjoy. And if you try the spanikopita. Let me know what you think. All hail the spanikopita Gods! Hallelujah! This is my one weakness (well, and Shepherd’s Pie too) from my pre-vegan days. I will hug a drummer and celebrate all the days of the week with this one! Thanks Ruth. Awesome. Hallelujah indeed! I’ve been living off them for the last couple of days since we made lots. So good and dilly. Love them. If you try them, let me know how they turn out. Great idea to use tofu instead of the feta! The fresh dill is SO key. This would be a great party dish. I love spanakopita! I made some recently, too (it’s a pretty awesome brunch dish…). I didn’t know about rolling it like that, though, so I just made one giant pyrex dish of it, then cut it into squares. Thanks for the lovely how-to photos!